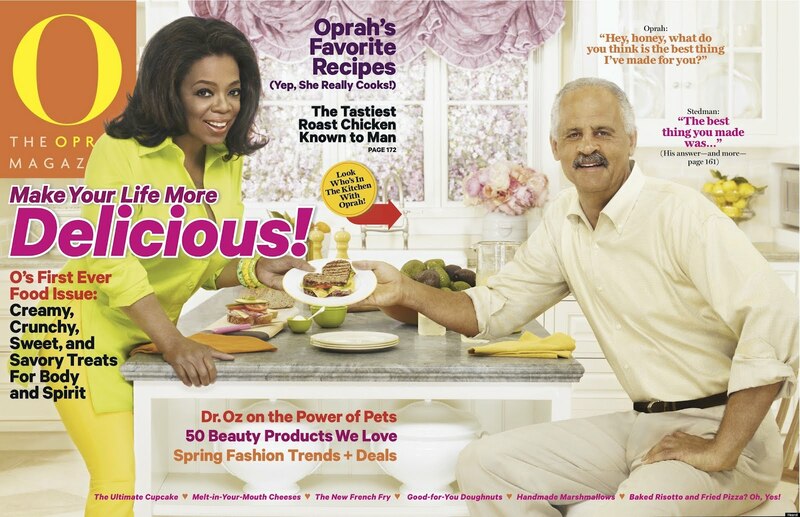 In a very rare move, Oprah graces the cover of April's O magazine with her long-time partner Stedman Graham. In the magazine the couple discuss Oprah's cooking and how much Stedman enjoys it. I can hear all the men saying, "Well if Oprah can cook for her man surely you can make me a sandwich." LOL...you know I'm telling the truth. The daytime queen and Graham have been famously private about their twenty-five year relationship. Oprah and Stedman rarely appear in public together, and Oprah was stunned when he famously paid her a tribute at her farewell spectacular last year. The latest issue of O magazine is all about food, and the two open up about Oprah's cooking and her famous "Love Sandwich." Oprah describes herself as "an improvisational cook" who doesn't usually look at recipes. Meanwhile, Stedman gushes about Oprah's cooking. “Chefs don’t have anything on her,” he said, calling her a "fantastic cook." He adds that he enjoys anything she makes, but names a few things in particular. "She makes great pancakes, too. She makes great eggs, she makes great steaks—I mean, you could go on and on and on," he says. Oprah also reveals the origins of the "Love Sandwich," which has become somewhat of a Saturday afternoon staple for the couple. "It became the Love Sandwich because I first started making it just for Stedman," she said. "I’ve only made it for a couple of other people, so if you’ve had me make the Love Sandwich for you, you have to be somebody I really care about."